There are times in life when you need to keep track of periodic events as they happen. For example when you have a new baby it is sometimes useful to keep track of when they feed, nappy changes, etc. Another example might be tracking how often you eat chocolate or drink beer. Clerk is a simple self-hosted web application that I built which you can install to the home screen of your device (by doing "add to home screen" in your browser) or load up on your tablet or laptop. You can then keep track of simple events with two taps on your device - once to open the app and once to record the event. 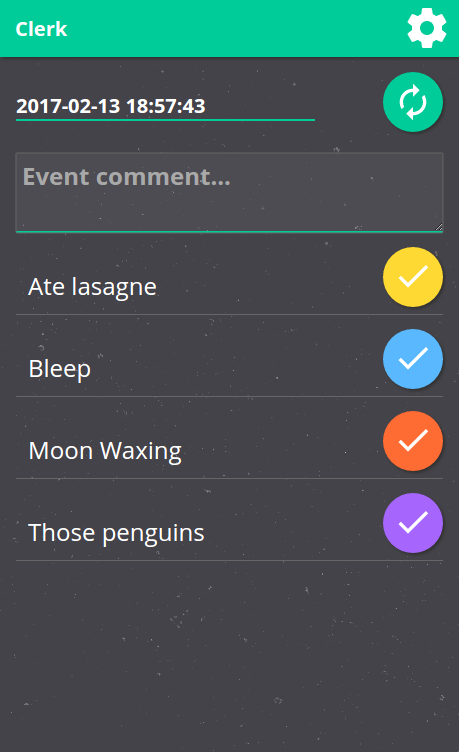 For every event logged the event type, timestamp, and comment are stored in CSV files. Events are stored in individual CSV files - one file per event type. 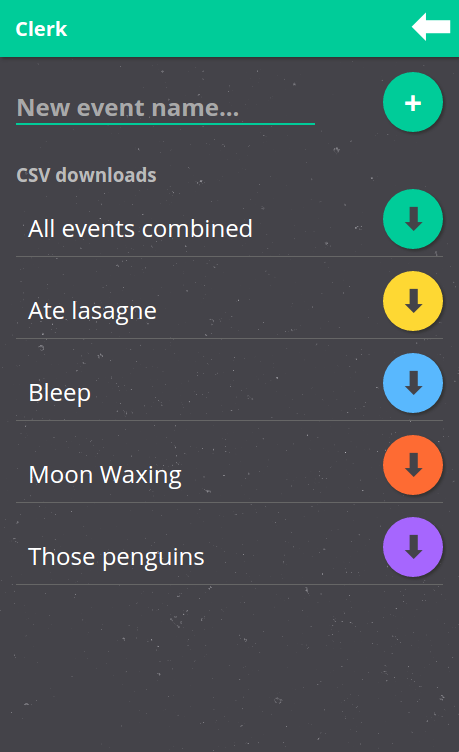 You can also download all CSVs stiched together with an extra column for the event name. Simple text based CSV format. Allows multiple people to log events. Mobile friendly - "Add to Home Screen" web-app. Download a release or get the source code with git clone https://github.com/chr15m/Clerk.git. Copy the files to your PHP web hosting. Then copy ./example.htaccess to .htaccess and edit it.